The role and value of theory in improvement work in healthcare has been seriously underrecognised. We join others in proposing that more informed use of theory can strengthen improvement programmes and facilitate the evaluation of their effectiveness. Many professionals, including improvement practitioners, are unfortunately mystified—and alienated—by theory, which discourages them from using it in their work. In an effort to demystify theory we make the point in this paper that, far from being discretionary or superfluous, theory (‘reason-giving’), both informal and formal, is intimately woven into virtually all human endeavour. We explore the special characteristics of grand, mid-range and programme theory; consider the consequences of misusing theory or failing to use it; review the process of developing and applying programme theory; examine some emerging criteria of ‘good’ theory; and emphasise the value, as well as the challenge, of combining informal experience-based theory with formal, publicly developed theory. We conclude that although informal theory is always at work in improvement, practitioners are often not aware of it or do not make it explicit. The germane issue for improvement practitioners, therefore, is not whether they use theory but whether they make explicit the particular theory or theories, informal and formal, they actually use. Initiatives to improve quality and safety in healthcare all too frequently result in limited changes for the better or no meaningful changes at all, and the few that are successful are often hard to sustain or replicate in new contexts.1 Many of the difficulties of securing improvement lie in the enormous complexity of healthcare delivery systems, including their challenging technical, social, institutional and political contexts.2 But some challenges can be attributed to the persistent failure to take full advantage of informal and formal theory in planning and executing improvement efforts.3 It is of course possible to achieve high levels of quality and safety on the basis of intuition derived from experience alone, with little evident help from formal theory. The few successful examples that exist do not, however, help to build a science. In this article, we join others in arguing that the explicit application of theory could shorten the time needed to develop improvement interventions, optimise their design, identify conditions of context necessary for their success, and enhance learning from those efforts.4–9 The need for more effective use of formal theory in improvement is increasingly pressing, because personal intuition is often biased, distorted and limited in scope10 and the application of formal theory enables the maximum exploitation of learning and accumulation of knowledge, and promotes the transfer of learning from one project, one context, one challenge, to the next. We are concerned in this article with demystifying the nature of theory and making clear its many and various roles in carrying out and evaluating improvement, not with the place of theory in the vast (and often contentious) body of literature on the philosophy of science. We also acknowledge that the term ‘theory’ itself can make people's eyes glaze over, because ‘theory’ is seen as something abstract, intimidating and irrelevant, especially when their immediate and true concern is the hard work at the sharp end of providing care, rather than theory itself. Yet the urge to find and use reasons—and thus to theorise—is irresistible; people look for explanations, understandings and causes easily and almost automatically, virtually every minute of the day, to the point where the social scientist Charles Tilly has suggested “We might…define human beings as reason-giving animals”.16 It is useful to understand as ‘theoretical’ any account that simply asserts that a meaningful interaction exists between variables (since this is a causal theory),17 as is any account that provides a coherent picture, in the form of a map or model, of a complex phenomenon or interaction, and that may describe how an independent variable changes the behaviour of a dependent variable (since this is an explanatory theory).18 (Prominent explanatory theories in natural sciences include the theory of evolution, the periodic table of the elements, and the double helix structure of DNA.) Thus, an improver who tells us that “Introducing a new guideline on care of urinary tract infections will reduce the rate of infection” is making a (causal) theoretical claim; she is making a different (explanatory) theoretical claim when she adds that “the guideline will do this by describing and justifying to practitioners the correct standards of care”. The key challenge for practitioners is not simply to base their work on theory (they always work from implicit assumptions and rationales, whether or not they do so consciously), but to make explicit the informal and formal theories they are actually using. In this regard, Tilly usefully distinguishes a spectrum of theories.16 At the least structured end, reason-giving consists mainly of stories, an everyday ‘informal’ resource that is routinely drawn on as people seek to explain what they see, experience and learn. At the other, most structured, end are technical or ‘formal’ accounts: the specialised concepts that underpin the scholarly disciplines, especially the pure and applied sciences. How these more formalised theories might improve improvement, particularly when they are combined skilfully with informal, often unarticulated, theories based on personal experience, is our focus of interest. For both improvers and researchers, we can make a very useful and important—though heuristic (rule of thumb)—distinction between grand theory, mid-range theory (‘big theory’) and programme theory (‘small theory’). Grand theory—such as a theory of social inequality, for example—is formulated at a high level of abstraction; it makes generalisations that apply across many different domains. Although such abstract or overarching theory does not usually provide specific rules that can be applied to particular situations, it does supply a ‘language from which to construct particular descriptions and themes’,19 and can reveal assumptions and world-views that would otherwise remain underarticulated or internally contradictory. Middle (or ‘mid’)-range theories (in the vernacular, ‘big’ theories), were described initially by the sociologist Merton20 as theories that are delimited in their area of application, and are intermediate between ‘minor working hypotheses’ and the ‘all-inclusive speculations comprising a master conceptual scheme’. The initial formulation and reformulation of grand and mid-level theories tends to be the preserve of academic researchers, but such theories are often useful to improvers as frameworks for understanding a problem or as guides to develop specific interventions. For example, the theory of the diffusion of innovations21 ,22 is a mid-range theory whose use has become second nature to many improvers when, for example, they recruit opinion leaders, work through social and professional networks, make innovations easier to try and tailor innovations to make them consistent with existing systems. Similarly, Normalisation Process Theory,23 which describes how practices can become routinely embedded in social contexts, can play an important role in orienting people designing improvement interventions towards what is likely to be important, relevant and feasible in making their efforts successful. Programme theories, on the other hand, provide what Lipsey24 terms a ‘small theory’ for each intervention. Pioneered by evaluation scientists,24–27 such theories are purposefully practical and accessible; they are also specific to each programme or intervention, even if they share much in common with other, similar, programmes and interventions. Ideally every improvement effort should have one. Concrete working models more than abstractions, programme theories typically accomplish two things. First, they specify the components of a programme (or intervention) intended to mitigate or solve the problem, the intervention's expected outcomes and the methods for assessing those outcomes (box 1), often in the form of a logic model or driver diagram.28 Second, they offer what the evaluation scientist Carol Weiss27 describes as a programme's ‘theory of change’, by which she means the rationale and assumptions about mechanisms that link a programme's processes and inputs to outcomes—both intended and unintended, as well as specifying the conditions (or context) necessary for effectiveness. A fully specified programme theory for an improvement intervention thus combines an (often diagrammatic) account of the intervention's components together with a narrative about the structures, behaviours, processes and contextual features that will be needed to achieve the aims and actions of the intervention (box 1 and figure 1). 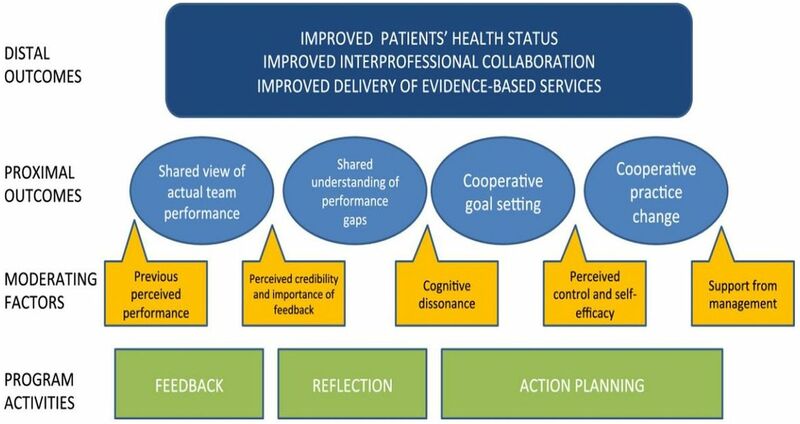 A Canadian programme sought to engage front-line health professionals in continuously improving the services they offered to people with chronic conditions.29 A programme theory-driven evaluation approach was used to describe the processes that might lead to the programme outcomes, and the conditions under which these processes were believed to operate. Using multiple sources—literature review, programme documents, committee meetings, observations, focus groups and interviews—a programme theory was developed. This took the form of a diagram (figure 1) and a narrative account of the theoretical basis of the intervention. The narrative identified relevant mid-range theories—including work motivation theory and reflective learning—as well as the importance of dissonance between actual behaviour, pursued goals and outcomes. It showed the relevance of these to components of the intervention, which included feedback, reflective learning and action planning. The articulation of this theory helps in characterising the programme components, the mediating processes through which they work and the moderating factors related to participants and contexts, as well as improving the ability to measure the intervention's impacts on practice change. Programme (impact) theory of an intervention to improve care of people with chronic medical conditions. 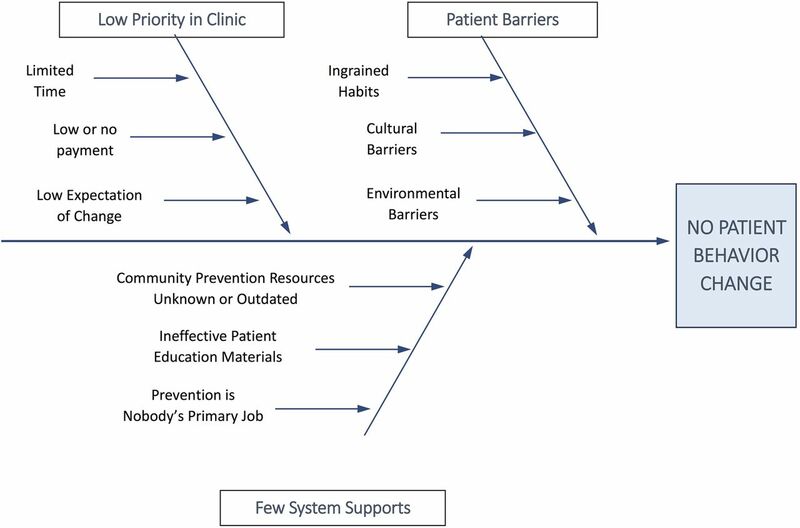 Ishikawa ‘fishbone’ diagram: explanatory theory of barriers in primary care to the support of health-related patient behaviours. 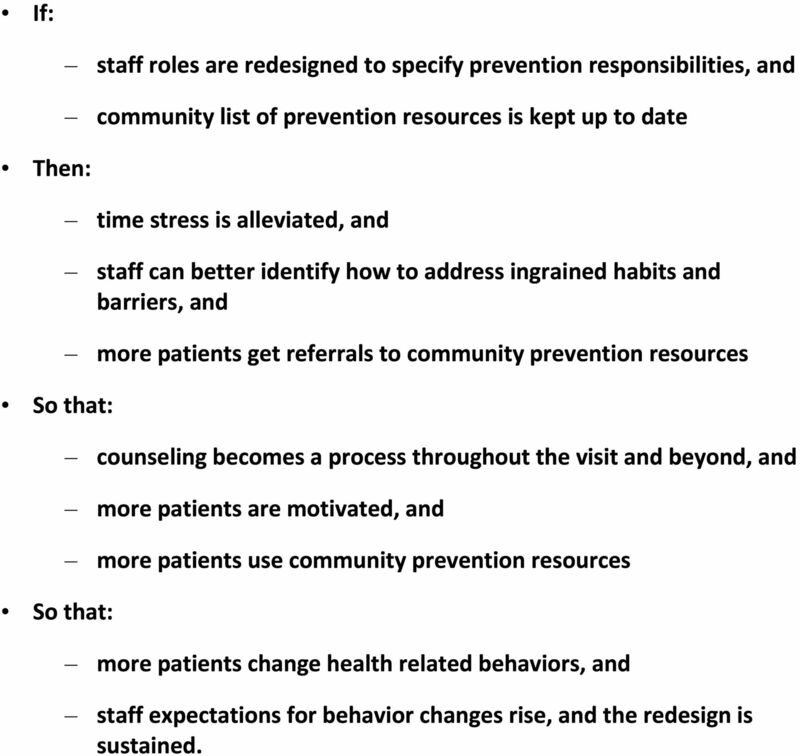 Programme theory (theory of change) for overcoming barriers to the implementation of behaviour change interventions in primary care. A key point is that articulating a programme theory is both feasible and practical, even for practitioners accustomed to ‘flying by the seat of their pants’. What the development of a programme theory can achieve is to shift improvement practitioners’ thinking from the implicit to the explicit, thus giving voice to the (often unrecognised) assumptions that guide their interventions, enabling the detection of any lack of consensus among team members, and surfacing weakness or incoherence in the proposed intervention's causal logic. Failure to use the various elements of formal theory adequately has frustrated the efficacy and understanding of improvement interventions, and has inhibited the learning that can inform planning of future interventions. For instance, despite the ubiquity of audit and feedback interventions as an improvement technique, an initial Cochrane review40 was able to offer few useful recommendations on making this technique effective because of weaknesses in the theoretical underpinning of this review's analysis. An updated review41 using a method42 that drew on formal theory43 demonstrated that audit and feedback interventions were demonstrably effective when improvers using those methods included explicit targets and action plans in their interventions—exactly the kind of finding that is most helpful to those seeking to secure positive change. An improvement team is well-advised therefore to start by sketching out an intervention, then identifying its components and the relationships that link their application with the desired outcomes. To give their initial programme theory this added depth and specificity the team will need to articulate the assumptions that underlie the selection of the intervention's components and theory of change, then seek to assess those assumptions against relevant theories at higher levels of abstraction. Grand and mid-range theories can be especially helpful in generalising learning from situations that initially appear new and unique, in part by distinguishing proximal causes (the most immediate action that makes something happen) from distal causes (deeper structures that may lie behind patterns of effects). In important ways, this blending of informal and formal theories resembles the process of formulating accurate diagnoses in medical practice.65 As expert practitioners solve problems, they move back and forth among the observed realities of the problem being addressed, their own stored knowledge of formal theory, and their (often extremely large) repertoires of concrete examples, images, understandings and actions gleaned from experience. During this process they iteratively reframe their perception of the problem situation, and explore the impact of proposed interventions by conducting small tests of change (experiments), either virtually or in the real world.19 The value of combining informal and formal theory highlights the point that improvement interventions do not always need to flow deductively from established formal theories. Requiring them to do so could significantly stifle innovation, since in discovering and refining innovations “Personal experience, intuition and luck still play a role alongside rigorous science and rational thinking, and they probably always will.”66 Established pre-existing theory (eg, mid-range theory) is therefore best considered a resource, not a shackle. The important point here is that in order to increase the impact of interventions and the likelihood that others can replicate them successfully, improvers need to be explicit about what they are doing and why. Stated differently, they need to demonstrate that there is a reasonable expectation, based on what is already known, that a new intervention will work, and with a minimum of collateral damage. Box 3 provides a particularly useful example of the various roles theory can play in planning, executing and evaluating an improvement initiative. Of special note in this example is the interweaving of informal theories (some based on the improvement team's prior personal experience, others that emerged during the programme's implementation) and formal published theory identified early in the planning of the intervention. This intervention led to an increase in the facility's deep vein thrombosis prophylaxis performance to a level that met the Veterans Administration External Peer Review Programme national target. Different disciplines sometimes have diverging views of ‘goodness’ (or quality) as it applies to theory, or indeed what constitutes theory at all. Some criteria for ‘good’ theory in improvement have begun to emerge, but their development is still very much a work in progress. Some criteria apply to virtually all theories in a given area of interest, while others are specific to the purposes for which particular theories will be used, or to their disciplinary origins. Emerging cross-disciplinary criteria might help users evaluate which theories are likely to be most useful for their purpose. For example, a recent consensus exercise of psychologists, sociologists, anthropologists and economists identified nine criteria for theories relevant to the area of behaviour change (box 4).69 ,70 Similarly, Grol et al7 have identified four important domains of theory related to the multiple layers of social and economic context required for success in changing the behaviour of providers and patients (actions of individual stakeholders; interpersonal interaction and social context; organisational context; and fiscal incentives, supports and constraints). Although uninhibited proliferation of theories of social change can be seen as problematical, the emergence of other such examples of ‘good’ theory is likely to be helpful as the field of improvement studies evolves. Theory need not mystify—or alienate—practitioners of improvement; it is not simply an arcane, abstract concept of interest mainly to scholars. Indeed, as Tolstoy put it, “The need to seek causes has been put into the soul of man”.72 Theory takes many forms, some informal, some highly structured: explanatory maps and models that make sense of complex situations; statements that call out testable causal relationships; sweeping generalisations that cover broad areas of interest; concrete descriptions of intervention methods and their mechanisms of action. Formal theory complements informal, experience-based theory, helping to define areas of dysfunction in healthcare systems, pinpoint their loci, and identify their possible mechanisms.18 It can provide frameworks that allow the accumulation of knowledge based on informal or small theories and empirical observations. For improvers and researchers, a well-formulated programme theory is likely to enhance the work of improvement, evaluation and research. Among other things, programme theories enable clarity about the components of a programme, the mechanisms through which the programme activities are thought to lead to the intended outcomes, the key outcomes to be assessed, plus the measurement tools, analytical approaches and data collection methods and standards that will be used. In the near term, greater and more effective use of theory in improvement work could be usefully supported in a number of ways, for example: by identifying theory in publication guidelines as an essential element in doing, studying and reporting improvement work; by creating a publication guideline specifically devoted to the complete, precise reporting of the use of theory in improvement projects; and by developing a compendium of well-constructed reports that demonstrate the effective use of theory in actual improvement projects. Over the long term, a broad research agenda will also need to address the deeper aspects of theory as it is used in improvement. But the germane issue for improvement practitioners at this point remains not so much whether they use theory—they always do, even when they are not aware of it—but whether they make explicit and well-founded the theory or theories they actually use. The authors are grateful for comments on earlier drafts of this paper by the members of the Health Foundation's Improvement Science Development Group.
. Complicated and complex systems: what would successful reform of Medicare look like? Toronto: Commission on the Future of Health Care in Canada, 2002.
eds. Improving patient care: the implementation of change in health care. Hoboken, NJ: John Wiley & Sons, 2013.
. Thinking, fast and slow. New York: Farrar, Straus and Giroux, 2011.
. Governing the commons: the evolution of institutions for collective action. Cambridge, UK: Cambridge University Press, 1990.
. Why? Princeton, NJ: Princeton University Press, 2006.
. A model discipline: political science and the logic of representations. New York, NY: Oxford University Press, 2012.
. The reflective practitioner: how professionals think in action. Aldershot, UK: Ashgate Publishing, 1991.
. Social theory and social structure. New York, NY: Free Press, 1968.
. Diffusion of innovations. 5th edn. New York, NY: Free Press, 2003.
. Practical programme evaluation: assessing and improving planning, implementation, and effectiveness. Thousand Oaks, CA: Sage, 2005.
. Nothing as practical as a good theory: exploring theory-based evaluation for comprehensive community initiatives for children and families. In: Connell J, Kuchisch A, Schorr LB, et al. eds. New approaches to evaluating community initiatives: concepts, methods and contexts. 1st edn. New York, NY: Aspen Institute, 1995:65–92. Rossi PH, Lipsey MW, Freeman HE. Evaluation: a systematic approach. 7th edn. Thousand Oaks, CA: Sage, 2003.
. Closing the quality gap: a critical analysis of quality improvement strategies. Tech Rev 2005;3:Hypertension Care(9.3).
. The health care data guide: learning from data for improvement. San Francisco, CA: Jossey-Bass Publisher, 2011.
. Audit and feedback: effects on professional practice and health care outcomes. Cochrane Database Syst Rev 2006;(2):CD000259.
. Cargo cult science: some remarks on science, pseudoscience, and learning how to not fool yourself. In: Feynman RP, Robbins J. eds. The pleasure of finding things out. Cambridge, MA: Perseus Books, 1999:205–16.
. The problem of context in quality improvement. In: Perspectives on context. London: Health Foundation, 2014:87–101.
. Organizing for quality: the improvement journeys of leading hospitals in Europe and the United States. Abingdon, UK: Radcliffe Publishing, 2008.
. Context is everything. In: Perspectives on context. London: Health Foundation, 2014:3–29.
. Experiential learning: experience as the source of learning and development. Englewood Cliffs, NJ: Prentice-Hall, 1984.
. Cognitive science in medicine. Cambridge, MA: MIT Press, 1989.
. Changing medical practice through technology assessment. Santa Monica, CA: RAND Corporation, 1989.
. Medical problem solving: an analysis of clinical reasoning. Cambridge, MA: Harvard University Press, 1978.
. An ABC of behaviour change theories. London: Silverback Publishing, 2014.
. War and peace. New York, NY: Random House, 2007. Contributors The authors are listed in alphabetical order. FD led the drafting; all authors made major contributions to intellectual content, participated in writing and revision and signed off on the final draft. Funding This paper was written with the sponsorship and general support of the UK Health Foundation, through the support of its Improvement Science Development Group. Competing interests MD-W contribution to this article was funded by a Wellcome Trust Senior Investigator Award (WT097899) and was supported by University of Leicester study leave at Dartmouth College. Data sharing statement This paper involves no original research data.